The wedding of Cana takes place prior to Jesus' first Passover during his ministry. Cana is in northern Israel. Jesus goes to Jerusalem for his first Passover feast during his ministry. While in the Jerusalem area, Jesus has a meeting with Nicodemus. Jesus and his disciples leave the city (Jerusalem) and go to the Jordan to minister and baptize. John the Baptist is questioned by his disciples regarding Jesus' ministry. Jesus leaves Judea and passes through Samaria on his way to Galilee when he encounters the woman at the well. The time of this event is given in John 4:35 as being four months before the barley harvest. Since the barley harvest is approximately the same time frame as the Passover, we can deduct from this that Jesus spent eight months or so in and around Jerusalem after the Passover Feast before returning to Galilee. It's at least an 80-mile trip back up to Cana in Galilee (northern Israel). (See the map to the right.) Jesus and his disciples go to Cana for a wedding to which they were apparently invited (verse 2). When the wine was gone, Mary looked to Jesus for a solution. The reply Jesus gave to his mother in verse 4 was not one of any disrespect; our English translation coupled with our cultural expectations make it sound that way, but the phrase in the Greek is actually quite respectful. As a matter of fact, the absence of a Greek verb in the first clause of that sentence requires that the English translation provide one. A word-for-word substitution (Greek to English) would be as follows: "What (why or who) to me and to you? Woman!" In other words, Jesus seems to be pointing out that the provision of wine for the guests is not really the responsibility of him or his mother. His explanation to that reply in verse 4 is also quite significant. Jesus was not there to be the center of attention. That's why he said "mine hour is not yet come." This "hour" Christ speaks of keeps coming up through the Book of John; Jesus is talking about his crucifixion. Nonetheless, he fulfills his mother's request by turning the water into wine - approximately 120 to 180 gallons of wine (1 firkin = approximately 10 gallons) that is better tasting than the wine served at the beginning of the feast. Would you expect anything less? The real story is in verse 11, "This beginning of miracles did Jesus in Cana of Galilee, and manifested forth his glory; and his disciples believed on him." Why did Jesus perform this miracle? It was for the same reason he performed all of his miracles - to "manifest forth his glory." Paul characterizes his Jewish brethren in I Corinthians 1:22 (see notes), "For the Jews require a sign, and the Greeks seek after wisdom:" All right Jews - here's your first sign! That's why Jesus performed the miracle of water to wine - for the Jews. Here's the first Passover Feast recorded during the ministry of Jesus. It is obvious that the original point of the animal sacrifice had been lost somewhere along the way. When Jesus goes to Jerusalem for the passover, he finds a disgusting sight in the temple - merchants selling sacrificial animals - so much for the firstlings of one's flock. People who are short on longsuffering often point to this occasion to justify their own actions when they lapse into a rage. There was no unbridled rage here on the part of Christ. The money changers were abusing the temple, and Christ invited them to stop...albeit with some persuasive force. Why do you suppose all those merchants allowed one man and only one man to drive them all out as he was able to do? Now it doesn't say in verse 17 that this incident was, in fact, a fulfillment of Psalms 69:9 (see notes), but that's the verse that came to the disciples' minds when the incident took place where we read, "And his disciples remembered that it was written, The zeal of thine house hath eaten me up." In verse 18 the Jewish leaders ask Jesus for a sign - a sign that would assure them that Jesus is within his authority to do what he has just done in the temple. That verse is packed with implications. First of all, there they are looking for a sign; obviously this crowd had not been present at the wedding in Cana to see that miracle (it was a three days' journey away from Jerusalem). But wait! There's more! Jesus, as far as they were concerned, had no authority to take temple-abuse matters into his own hands; everyone knew that. So, this must be a question about Messiahship they are asking. In their minds, if he is the Messiah, of course he has authority over the temple; but, they're thinking, show us a sign first to validate who you are. I'm convinced that these Jewish leaders were not open to the possibility of Jesus being the Messiah, but they felt that they needed to save face before all the those who had just viewed this incident. Then Jesus replies with a prophetic word that was well beyond their spiritual condition to receive in verse 19 when he says, "Destroy this temple, and in three days I will raise it up." Their reply in verse 20 demonstrates that they naturally assume that Jesus is referring to Herod's Temple with his comments, but he's obviously referring to his own resurrection (verse 21). In other words, "You want a sign? My resurrection will be your sign!" Perhaps even the disciples (verse 22) were a little slow in recognizing the implications here, but after his resurrection, everything fell into place for them. At one of Jesus' illegal trials prior to his crucifixion, false witnesses were quick to point out to Caiaphas in Matthew 26:61 (see notes) that Jesus had declared he would destroy the temple and rebuild it back in three days. We notice in verses 23-25 that this Passover gathering of Jews yields many people who believe on Jesus as a result of his miracles. It's interesting that Jesus did not use these Believers as a springboard into prominence among the Jews. Incidentally, Jesus makes another trip through the temple taking these same actions during the week prior to his crucifixion, recorded in Matthew 21:12-17; Mark 11:11-19; Luke 19:41-48 (see notes). It is interesting then that Jesus makes this visual statement of temple abuse during his first and last Passover Festival during his ministry. Only a select few of the Pharisees were on the 71-member ruling council known as the Sanhedrin, but Nicodemus was "a ruler of the Jews." That means, as we see in verse 1, he was a member. His night visit probably is indicative of the fact that he did not want to be seen visiting one-on-one with Jesus. He gets right to the point acknowledging Jesus as a "teacher come from God" (verse 2) based upon all things - miracles (remember I Corinthians 1:22, see notes). As a matter of fact, Nicodemus uses two titles of Jewish respect when addressing Jesus as "Rabbi" (Greek: rabbi) and "teacher" (Greek: didaskalos). Both are terms that demonstrate Nicodemus' regard for Jesus as a master teacher regarding the things of God. Jesus then gets right to the point, the born-again experience. Some misdirected would-be Bible scholars have taken this passage as a water-baptism-for-salvation mandate because of the mention of water in verse 5. Actually, Christ is differentiating the born-again experience from the physical birth here. Midwives often referred to the physical birth as a water birth due to the water that is released at the birth of a child. I'm certain that's the reference here based upon the context before and after verse 5. In verse 4, Nicodemus asks Jesus for a clarification when he asks if Jesus is talking about a second physical (water) birth. Then in verse 6, Jesus goes on to further clarify that the spiritual birth is different from the birth in the flesh (water birth). Don't allow people to read more into this verse than was intended. This water birth has nothing whatsoever to do with water baptism as a prerequisite to a completed salvation experience; read it in context (considering verses 4 and 6), and you must agree. If that concept seems difficult to comprehend for Nicodemus, Jesus adds to his explanation that...so is the wind (verse 8). You can see its effects and hear it, but you cannot see the actual wind. The exchange between Jesus and Nicodemus in verse 9-13 would indicate that Nicodemus was open, but not accepting of this new spiritual concept, the work of the spirit. The question Nicodemus asked in verse 9 is not to be understood as one expressing disbelief, but rather an honest inquiry about procedure. Literally, the Greek wording for that verse is best understood, "How is it possible for these things to become?" In other words, "How does one go about making this happen?" Jesus reacts to Nicodemus in such a way that signals the irony of a master teacher having no understanding of spiritual issues. The Pharisees were all about doing and legalism; spiritual leadership was foreign to them. It would appear that Nicodemus is present all the way down to verse 21. In verse 12 we get an indication that Nicodemus is still not convinced about the true identity of Jesus as the Christ. So, what sign will be given to Nicodemus (remember I Corinthians 1:22, see notes)? The crucifixion and resurrection! There it is in verse 14 where Jesus talks about the serpents that were sent by God among the Israelites when they murmured against God in Numbers 21:4-9 (see notes). How did they get healed from the bite of the serpents back then? A brass serpent was elevated upon a pole; when those bitten looked upon this serpent, they were healed. Here's yet another reference to the cross and resurrection as a sign of his Messiahship...given right here at the beginning of the earthly ministry of Jesus. Then Jesus gives a clear presentation to Nicodemus of the spiritual battle that exists between light and darkness - salvation and condemnation. Incidentally, we don't know the outcome of this meeting with regard to the salvation of Nicodemus. However, we do see Nicodemus paying his respects to Jesus after the crucifixion in John 19:39 (see notes). It is also important to recognize that Jesus presents himself to Nicodemus as a solution to a problem that all Jews wanted remedied. They looked for a day when they would find favor with God once again as it was in the days of King David. Jesus makes the comparison: The sickness of verse 14 and the serpent-on-a-pole remedy is like the spiritual blindness experienced by Nicodemus along with the other Jews and the cross. Nicodemus reflects the attitude of his fellow Jews in this passage as he does not recognize the spiritual problem of Israel, just their governmental predicament. Therefore, verses 15-21 are to be understood in light of the illustration of verse 14. The people were spiritually ill before Jesus' manifestation, just as the snake-bitten people. Those who refused to look upon the brass serpent for healing in Numbers 21:4-9 (see notes), died. Likewise, those who refuse to trust Jesus as Savior by being born again spiritually will die spiritually. This is succinctly expressed in John 3:16, "For God so loved the world, that he gave his only begotten Son, that whosoever believeth in him should not perish, but have everlasting life." And...why will people decline such an offer of spiritual life? There's your answer in verse 19, "...because their deeds were evil." That's because truth and light are compatible. People miss the truth (decline salvation in Christ) because their deeds are compatible with darkness i.e. "evil." Psalm 10:4 (see notes) expresses it like this, "The wicked, through the pride of his countenance, will not seek after God: God is not in all his thoughts." These events are not recorded in the synoptic gospels (Matthew, Mark and Luke). So, here's John the Baptist preaching and baptizing when along comes Jesus. Can someone please put this into perspective for us? The disciples of John the Baptist require a clarification regarding John's mission compared to the mission of Jesus. John begins addressing this issue in verse 27 and clearly identifies his own role in verse 30, "He must increase, but I must decrease." John the Baptist is then very clear about the identity and mission of Jesus in verse 36, "He that believeth on the Son hath everlasting life: and he that believeth not the Son shall not see life; but the wrath of God abideth on him." If there had been any question about the respective roles of John the Baptist and Jesus, this settles it. Matthew, Mark and Luke begin recording the earthly ministry of Jesus after the imprisonment of John the Baptist. Therefore, only John's Gospel has this early exchange regarding the differences between Jesus and John the Baptist. In retrospect, you can see from this incident that it was necessary for John's ministry to come to a close at the beginning of the ministry of Jesus. For more information regarding John the Baptist and his ministry, click here to read the article entitled, "Was John the Baptist Elijah?" Staying around Judaea (Jerusalem and surrounding area) was always intense. That's where the Sanhedrin members lived; that's where Jewish religious scrutiny abounded. It would appear that, from even the early portion of Jesus' ministry, an all-points-bulletin had been issued on Jesus around Jerusalem. Galilee was in Northern Israel and seemed to serve as the home base for Jesus and his disciples at this point in time. 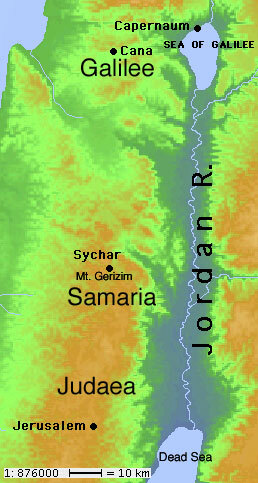 In between Jerusalem and Galilee was Sychar, a city in Samaria. (See the map to the right and top of this page.) The reference in verse 5 regarding Jacob and Joseph goes back to Genesis 48:22 (see notes). The Samaritans were a mixed breed of not-fully Jewish people as far as the Jews were concerned (see the inset frame to the right for more information on them). The Jews usually avoided any contact with them, but not Jesus. On his way back to Galilee, Jesus walks right up to the Samaritan woman and begins conversing with her at Jacob's well. She's obviously surprised that a Jew would stop to talk with her. She explains her religious beliefs to Jesus and identifies Mount Gerizim, just above where they were standing, as the established Samaritan worship location as opposed to the temple in Jerusalem where Jews worshipped (see the inset frame to the right for more information on Mount Gerizim). In the course of the conversation about the well water, Jesus says in verse 10, "If thou knewest the gift of God, and who it is that saith to thee, Give me to drink; thou wouldest have asked of him, and he would have given thee living water." The woman obviously understands the implications here when she says in verse 15, "Sir, give me this water, that I thirst not, neither come hither to draw." Jesus demonstrates his revelatory ability to the woman's satisfaction in verses 16-19, and then the conversation turns to worship. Let's get right to the important principle that Jesus established here - worship. Jesus explains that there is coming a day when people will not go to a specific place to worship. He says in verse 24, "God is a Spirit: and they that worship him must worship him in spirit and in truth." Paul would later explain in I Corinthians 3:16 (see notes), "Know ye not that ye are the temple of God, and that the Spirit of God dwelleth in you?" That literally means that today God's house is not any particular physical location, but every Believer is God's house because of the indwelling of the Holy Spirit at salvation. I Corinthians 12:13 (see notes) says, "For by one Spirit are we all baptized into one body..." We see that all Believers are indwelt by the Holy Spirit in Romans 8:9, "...Now if any man have not the Spirit of Christ, he is none of his." We (Believers) are the equivalent of the temple in Jerusalem. God dwells in us (not in a physical building) through the Holy Spirit. That's the point Jesus makes to the woman. Worship now should take place 24 hours a day, 7 days a week within each Believer; that's the normal Christian life. If you only worship once or twice a week, you're falling waaaaaay short on worship time. Well, many Samaritans gladly received this message and Jesus stayed on to teach this new concept of worship for a couple days afterward. A distinction should be made here in verse 19 between this woman's early realization as compared to later in the passage. When Jesus reveals his knowledge of her marital history, she declares him to be "a prophet." However, after Jesus explains the nature of true worship in verse 24, the woman acknowledges her understanding of the enlightenment that will come at the appearance of the Messiah. Jesus acknowledges that he is that Messiah in verse 26, "Jesus saith unto her, I that speak unto thee am he." At that point, the woman fully accepts the role of Jesus as the Messiah as she heads back to the city to tell her friends and relatives. As these Samaritans approach for a teaching session from Jesus, the disciples express concern about Jesus' welfare with regard to exhaustion. Jesus explains to them that they must minister when the opportunity avails itself (verses 35-38). As a result, many more believed on Jesus as the Messiah in the subsequent two days. We seem to have some indication of when this event with the Samaritan woman took place in verse 35 when Jesus says to his disciples, "Say not ye, There are yet four months, and then cometh harvest? behold, I say unto you, Lift up your eyes, and look on the fields; for they are white already to harvest." That's an obvious reference to the barley harvest which turns from green to almost white when it's time to harvest it. That harvest typically ran from mid-April through the end of May. The Feast of Firstfruits was the annual celebration of this harvest, the date (first Sunday after Nisan 15) to which Jesus would be referring here. That date falls two to three weeks after the Passover. That would place this woman-at-the-well incident somewhere between December to the first part of January between the first and second Passovers of Jesus' ministry. That fits nicely with the notion that the "feast of the Jews" in John 5:1 (see notes) is, indeed, a reference to the second Passover feast during the ministry of Jesus.